Finally, the French military gets the war game it deserves. It’s easy to pick on the French. It’s been, what, nearly a couple of hundred years since the French military saw any real glory? A similar thing can be said about turn-based strategy games, whose glory days seem like a lifetime ago. 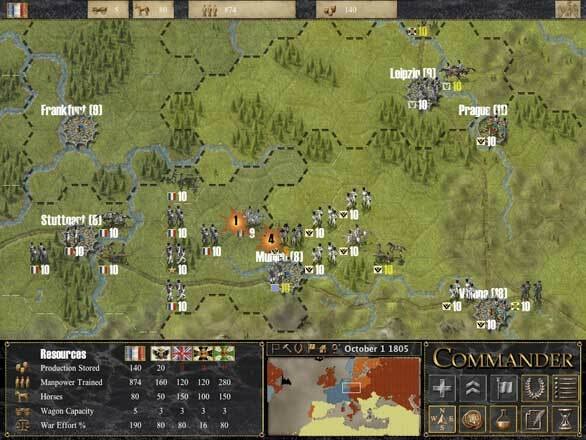 Both get a bit of redemption with Commander: Napoleon at War, a turn-based strategy game starring the French military during the height of Napoleon’s empire. Turn back the clock to the early 19th century. Napoleon is leading his armies all over Europe against a changing coalition of European countries, including at times Russia, England, Prussia, Austria, and Portugal. You play as either the leader of the French or the Coalition in a turn-based quest for conquest. The game really thrives when you play the Grand Campaign from 1805 to 1814; seeing the entirety of Europe in play and fighting a war on multiple fronts is a truly epic experience. But for players who don’t want a game with 169 turns, smaller scenarios (as short as five turns) are also available. The tutorial details some of the general concepts of the game’s interface, including how to raise troops, how to move, how to improve your technology, and how to declare war on a neutral or allied country (surprisingly useful if you ever want to gain a country’s resources or feel that Sweden is getting uppity). But on the whole the tutorial does an abysmal job of answering basic inquiries, like how to acquire resources, or how weather affects combat, or what happens when your armies get stretched too thin. All of these questions you’ll have to answer for yourself, and in my case they came up when I was invading Moscow. I had four gunnery regiments ready to pummel the city’s defenders but both armies fired harmlessly at each other and had to wait for the snow to subside. I did appreciate the historically accurate lesson though: Never invade Russia in winter. The bigger scenarios stretch on land and sea, and require you to either guide the forces of the Coalition or France to victory by invading and conquering your enemy’s capitals. You guide units of infantry, line infantry, militia, cavalry, artillery, or ships. 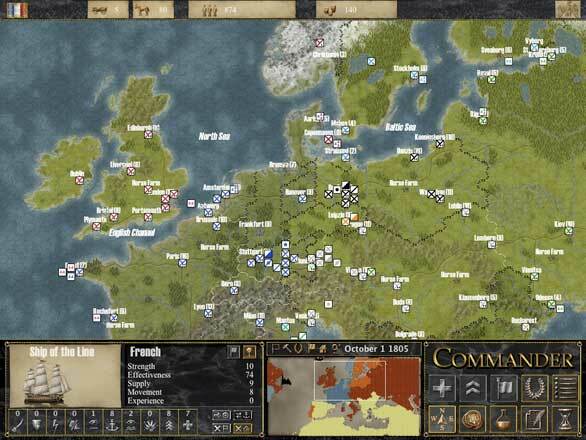 The grid map mandates that you only have one unit per grid area and the turn based combat is determined by factors including strength, location, weather, experience, and chance—thus giving Commander: Napoleon at War the feel of an animated game of Risk. Despite my initial frustrations with the tutorial, I found it was pretty easy to pick up the rules of the game and engrossing to play. You raise units with production points which are either gained by capturing farms and cities or by protecting your shipping lines from the New World. The British have the best navy in the game, so they’ll constantly sink your trade ships if a clever French commander doesn’t send escorts. Artillery is important to take out clumped troops or to break a city’s walls, but be sure to have infantry nearby because artillery is fragile—especially against cavalry. Certain units, like cavalry and frigates, can move further on the grid in a single turn than say a foot cannon regiment or a militia unit. For faster deployment, you can employ wagons to ship certain units to allied cities or have them load up in a seaport before deploying to a transport. Commander: Napoleon at War has some clever tactical nuances, such as upgrading technologies or seeing that trade routes genuinely affect your military’s health. But there are some frustrating components to the gameplay as well. Moving artillery and having them fire during the same turn is always a risky proposition, because despite a little crosshairs that indicates your cannon’s range, sometimes your artillery units seem blind to an enemy two grid spaces away. Frustratingly, after you move your unit, you must immediately order it to fire or else you’ll lose the ability for that turn. While you can have your troops load up in transports and invade an enemy island, like stars in an increasingly obtuse NBC drama, there is no way to get them off the island afterwards. Couldn’t they just hop on the transport ship that dropped them off? Or a nearby allied ship? Without supplies, the troops lose points and are basically left to starve. With France, I conquered Russia, Prussia, and all of mainland Europe but still couldn’t raise new troops to invade Britain without suffering from a penalty for overburdening my population with my army’s upkeep. Wouldn’t my allies be able to contribute troops at this point? But no, when you conquer an enemy country, you don’t gain their troops, just some of their resources, and can’t deploy troops to their capital. This last quirky rule is annoying because in the French campaign Vienna will eventually revolt so it would be nice to have some troops there to put that down or at least raze the city. The enemy artificial intelligence, aside from making a beeline for your merchant ships, largely likes to move its troops back and forth, seemingly afraid that if left to dig in, they’d rust. Your brilliant tactics usually will work because the enemy AI is wearing a newspaper hat and playing in the proverbial bathtub. There are non-tactical elements that are disappointing as well. The scale is daunting and impressive but the game doesn’t have a story mode or chapters to guide you into the combat; the smaller missions are too short and feel pointless comparatively. For example, the Waterloo mission has five moves and not enough time to fully complete either side’s objectives. Typos riddle the menu screens and the graphics could not only be handled on my 2.4GHz Core 2 Duo MacBook Pro, but probably on something running Windows 95. When loading a scenario or game, the Mac OS menu pops up so you can load the correct file. It’s a small thing, but very unprofessional looking. How hard is it to write in-game load menu? The multiplayer options aren’t well explained either, but you can play online or using the same keyboard. Commander: Napoleon at War is for dedicated strategy fans that have a passion for history, engrossing (and long) engagements and don’t mind seeing the exposed seams in the game’s fabric. The exceedingly stupid enemy AI and strange tactical limitations handicap what otherwise is a strong combination of historical accuracy and easy-to-learn strategic fun.